All entries must be received by 11:59pm ET on December 11, 2016. Limit one (1) Entry Form per person, per email address during the Contest Period. Multiple participants are not permitted to share the same email address. Any attempt by any participant to submit more than one (1) Entry Form by using multiple/different email addresses, identities, registrations and logins, or any other methods will void that participant may be disqualified. Use of any automated system to participate is prohibited and will result in disqualification. 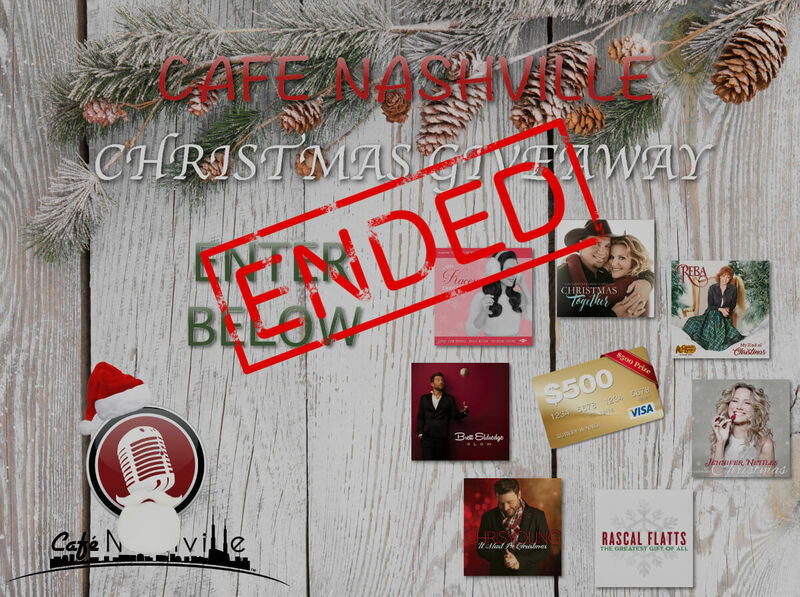 Café Nashville / On-Air Broadcasting is not responsible for lost, late, incomplete, invalid, unintelligible, inappropriate or misdirected registrations, all of which will be disqualified. In the event of a dispute as to any registration, the authorized account holder of the email address used to register will be deemed to be the participant. The “authorized account holder” is the natural person assigned an email address by an Internet access provider, online service provider or other organization responsible for assigning email addresses for the domain associated with the submitted address. Potential winner may be required to show proof of being the authorized account holder. All entries become the sole and exclusive property of Sponsor and will not be returned. Sponsor reserves the right to contact entrants and all other individuals whose email address is submitted as part of this promotion. No mail-in entries will be accepted. Winner Selections: On December 12, 2016. Sponsor will select one (1) Entry Form for the Grand Prize described below in a random drawing of all valid Entry Forms received during the Contest Period. All winning entrants will be contacted using the email address and/or telephone number provided with the Entry Form and may be awarded the prize (subject to verification of eligibility and compliance with the terms of these rules). Sponsor’s decisions as to the administration and operation of the contest and the selection of the potential winners are final and binding in all matters related to the Contest. Failure to respond to the initial verification contact within 24 hours of notification will result in disqualification. One winner per household per 90 days. Sponsor reserves the right to substitute any listed prize for one of equal or greater value for any reason. Entry Conditions and Release. By entering, each participant agrees to: (a) comply with and be bound by these Official Rules and the decisions of the Sponsor, which are binding and final in all matters relating to this contest; (b) release and hold harmless Café Nashville/On-Air Broadcasting, subsidiaries, and affiliated companies, participating sponsors, the prize suppliers and any other organizations responsible for sponsoring, fulfilling, administering, advertising or promoting the contest, and each of their respective past and present officers, directors, employees, agents and representatives (collectively, the “Released Parties”) from and against any and all claims, expenses, and liability, including but not limited to negligence and damages of any kind to persons and property, including but not limited to invasion of privacy (under appropriation, intrusion, public disclosure of private facts, false light in the public eye or other legal theory), defamation, slander, libel, violation of right of publicity, infringement of trademark, copyright or other intellectual property rights, property damage, or death or personal injury arising out of or relating to a participant’s entry, creation of an entry or submission of an entry, participation in the Sweepstakes, acceptance or use or misuse of prize (including any travel or activity related thereto) and/or the broadcast, exploitation or use of entry; and (c) indemnify, defend and hold harmless the Released Parties from and against any and all claims, expenses, and liabilities (including reasonable attorneys’ fees) arising out of or relating to an entrant’s participation in the Sweepstakes and/or entrant’s acceptance, use, non-use or misuse of the prize. General Conditions. Sponsor reserves the right to cancel, suspend and/or modify the contest, or any part of it, if any fraud, technical failures or any other factor beyond Sponsor’s reasonable control impairs the integrity or proper functioning of the contest, as determined by Sponsor in its sole discretion. Sponsor reserves the right in its sole discretion to disqualify any individual it finds to be tampering with the entry process or the operation of the Sweepstakes or to be acting in violation of these Official Rules or any other promotion or in an unsportsmanlike or disruptive manner. Any attempt by any person to deliberately undermine the legitimate operation of the contest may be a violation of criminal and civil law, and, should such an attempt be made, Sponsor reserves the right to seek damages from any such person to the fullest extent permitted by law. Sponsor’s failure to enforce any term of these Official Rules shall not constitute a waiver of that provision.